This gorgeous sixth floor penthouse deluxe one bedroom, two bathroom unit is newly remodeled and features contemporary Island style furnishings throughout. A fully equipped gourmet kitchen provides all your cooking needs, including granite countertops and stainless steel appliances. Come and enjoy this top floor oceanfront unit! 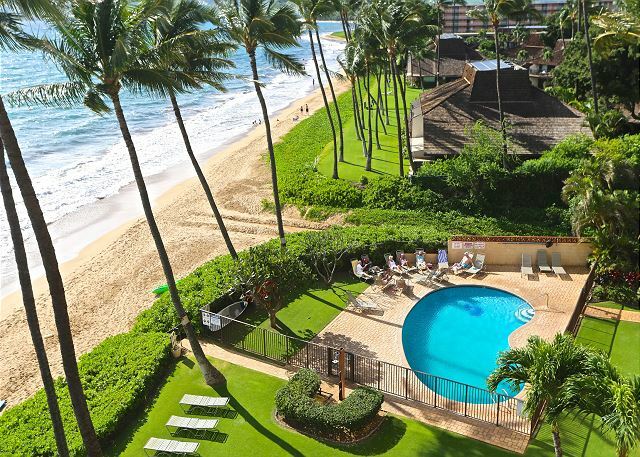 This top floor ocean front, ocean view penthouse unit is the perfect sanctuary for your Maui getaway! The open floor plan allows for a breezy and spacious feel, while the subtle color palette of the inviting living space reminds you that you are in paradise. Your bedroom boasts comfort with upscale linens for your cozy queen bed and custom bamboo furnishings. While freshening up or getting ready for your next excursion, you will appreciate your en suite bathroom. The updated en suite bathroom features tile floors, granite counter tops and lots of cabinet space. Relax in the comfortable living room while you cool off with the central A/C after a long day of playing! Ceiling fans in both the living area and bedroom keep you cool all day long. With new granite countertops, tiled floors, a custom bar area and a fully equipped kitchen, you can have a blast preparing your favorite island-style or home cooked meals! And reminisce about your day as you dine al fresco on the private lanai while enjoying the panoramic ocean views. You will want to sip your favorite beverage on your private lanai before heading up to the additional extra large lanai for some much needed stretching! You will be amazed by the sweeping views of Kahoolawe, Molokini and the turquoise waters of the Pacific Ocean. And the sunsets here are absolutely remarkable! ROOM AMENITIES: Smoke Free environment, AC, Free WiFi, Fully Equipped Kitchen (Cooking range/oven, Refrigerator, Dishwasher, Microwave, Blender, Coffee maker, Dishes & silverware) Cable television, DVD/CD player, Ceiling fan, Private lanai, Iron and ironing board, Additional linens and towels, complimentary starter kit of laundry detergent, shampoo, soap etc. Hair dryer, Beach gear (beach chairs, beach towels, a cooler and a beach umbrella) Free parking. We are always available to be reached via email or phone. Additional cleaning could be arranged at an additional fee; generally our long stay guests take advantage of this service. Our Maintenance team is on call and can assist at any time. Check-in and Check-out are very simple. We send you a pre-arrival email that has all necessary information on how to get to the condo, what the electronic door lock code is, pool access code, etc. We recommend you print the email prior to the trip or saving it on your smart phone to easily access it when you arrive at the complex. A private Concierge is always standing by to help with any activity bookings, island recommendations and restaurant reservations. Your home away from home is directly located on Sugar Beach, on the longest stretch of white sandy beach on Maui! Maui’s unique and varied terrain offers a multitude of activities from relaxing on some of the world’s most beautiful beaches to the more adventurous undertakings of zip-lining and paragliding; you will have an easy access to it all. Some of Maui’s top attractions are: Maalaea Harbor - 6 miles - Many boats leave from Maalaea on snorkeling trips, deep sea fishing, scuba diving, whale watching (in season), sunset cruises, and more. It is much faster to leave from Maalaea Harbor than Lahaina Harbor when taking trips to Molokini Crater and Turtle Town. Other attractions include Maui Ocean Center, Haleakala Volcano, Shops at Wailea, Iao Valley, Wailea Golf Club, King Kamehameha Golf Club, Maui Tropical Plantation, and the Whale Sanctuary. The town of Kihei is a quant, laid-back beach town boasting some of Maui’s most pristine stretches of white sand and turquoise waters. South Maui is fun for couples and families alike. Rooms Sleeps 4, The views from this gorgeous sixth floor penthouse will take your breath away! This deluxe one bedroom, two bathroom unit is newly remodeled and features your own private lanai PLUS an extra large lanai above perfect for morning exercises and yoga!